When Maggi Is The Only Option! Maggi noodles have been a popular snack and breakfast menu among all age groups especially among kids. It is an all-time favorite for kids and they never get bored of it! Even the most fussy and picky eater doesn't fail to relishes his bowl of Maggi! When children get addicted to Maggi, it is hard to get them off from their favorite dish. As a parent, take it as a challenge and get creative to make your child's favorite Maggi noodles more healthy and nutritious. It is important to note that you have to intelligently control the portion size of this processed and ready to eat food. • Bread noodle toast: Cook your regular Maggi with vegetables. On a slice of multigrain bread, spread the Maggi mixture. Grate some cheese and bake it in the oven till the cheese becomes golden brown. Though it is a hot favorite of kids, it is still a processed food with less nutritive value when compared to healthy homemade food. • Veg Maggi Roll: Cook your regular Maggi with vegetables, sprouts and paneer. (Cook it dry, so it won't drip from the roll). Spread this mixture on the chapatti and roll it. It can be a good breakfast menu, snack or packed lunch. • Stir Fried rice and Maggi noodles: Cook rice and Maggi separately. Stir fry finely chopped fresh and colorful vegetables. Mix rice and noodles with mild flavoring spices and serve garnished with corn and peas. Your kid will enjoy this yummy dish. • Vegetable Maggi Soup: Make a regular vegetable soup that your kid likes and add his favorite Maggi noodles in it. It can be a great mid-evening snack. • Maggi cutlet: Add some Maggi noodles to your regular shallow fried vegetable cutlet. Serve it in the form of a sandwich or a mini burger. Let your kid enjoy his Maggi but also make sure he learns to accept and appreciate the regional cuisine which is healthier and nutritious than Maggi. Though it is a popular snack since decades, it is still a controversial one and lots of studies are being done on its nutritional value. 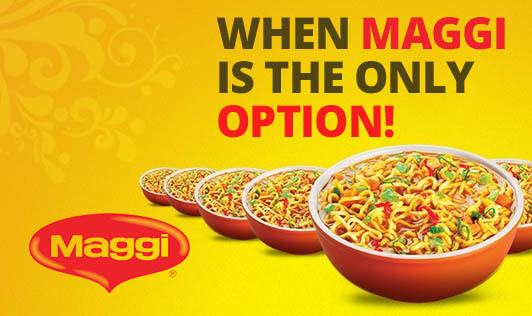 Let Maggi be an occasional treat than an everyday one!